Oman Company for the Development of Special Economic Zone at Al-Duqm (Tatweer) signed a Memorandum of Understanding (MOU) with ADANI PORTS AND SPECIAL ECONOMIC ZONE LIMITED in the Indian Capital; Delhi. 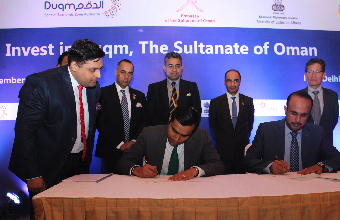 This agreement was executed in conclusion of the Promotional Campaign “INVEST IN DUQM” organized by Special Economic Zone Authority at Al-Duqm (SEZAD) in both Mumbai and Delhi of India and the events witnessed a vigorous participation from many of the companies operating in the area during the period from 25 and till 30 September 2017. The Memorandum of Understanding was signed by Mr. Ismail Bin Ahmed Al Belushi in his capacity as the Deputy CEO of the Special Economic Zone Authority at Al-Duqm on behalf of Al-Duqm Development Company (Tatweer) and from ADANI's Part, the Memorandum was signed by the Company's CEO; Mr. Karan Adani. The signing ceremony was attended and witnessed by H.E. Sheikh Hamad Bin Saif Al Rawahi; the Sultanate of Oman's Ambassador to India and some other officials from both the Omani and the Indian sides. The Signature of the said MoA comes as an indigenous endeavor exerted by both; ADANI PORTS AND SPECIAL ECONOMIC ZONE LIMITED AND SPECIAL ECONOMIC ZONE LIMITED and SEZAD to explore better investment opportunities in Special Economic Zone at Al-Duqm in the fields of concern to the company. The said Memorandum of Understanding stipulates upon setting an official and resilient framework for investment and cooperation between both parties and developing works in many key sectors in the Special Economic Zone at Al-Duqm. In the coming phase, ADANI PORTS AND SPECIAL ECONOMIC ZONE LIMITED will lodge a detailed list covering the projects it intends to set up in Al-Duqm and it will also determine the points of contracts and liaison between both parties to discuss all investment relevant topics. ADANI PORTS AND SPECIAL ECONOMIC ZONE LIMITED (APSEZL) is deemed the largest ports company in India and is currently in charge of handling Mundra Port located at the coast of Gujarat, India with 24 wharfs and Adani group is engaged in many infrastructure and industry sectors with investments valued approx.. 12b US dollars. Al-Duqm Development Company SAOC (Tatweer) is government company fully owned by SEZAD and it is its executive arm in the field of implementing the basic infrastructure projects and attracting investments into the zone. On the operation areas of the Adani Group operates, Karani Adani, CEO of Adani Port and Economic Zones Company, said the Group operates in key industries synonymous with driving economic growth and takes a leadership position in resources, logistics, energy and agro. "We pride ourselves on the scale of our ambition, speed of execution and quality of operations," stated Adani. "Founded in 1988 by first-generation entrepreneur, Gautam Adani, under his leadership we are India's fastest growing infrastructure group employing over 11,000 people in India and around the globe. Today, the Adani Group operates the largest pan-India network of seaports providing transport and distribution services nationwide. The Group is the India's leading private enterprise power generation and transmission, renewables and solar energy manufacturing, mining, gas and edible oil production," added Adani. He indicated that Mundra Port operated by the Group is India's largest private port and is the jewel in its network of 10 ports, which circumnavigate India. A container transshipment terminal is under construction at Vizhinjam, Kerala. "Adani Ports, and our fleet of ships, managed cargo volumes touching 170 MMT in 2017 and we expect to handle 200 MMT by 2020. Our logistics business comprising of rail and road transport services connects our ports to India's vast hinterland," elaborated CEO of Adani Port and Economic Zone Company. "Adani Group operates three solar power plants, including India's largest solar power plant in Tamil Nadu, with seven additional solar plants are under development across the country. We also operate India's largest solar manufacturing facility at Mundra. Our combined generating capacity is 2.0GW projected to 10GW of renewables output by 2022. Today, we have a power generation capacity of more than 10GW across four thermal power plants in the states of Gujarat, Maharashtra, Karnataka and Rajasthan, making us India's leading private sector power producer," added Adani. He noted that Adani Transmission is one of the largest private sector transmission companies in India with more than 5,000 circuit km of lines transmitting electricity across western, northern and central regions of India. To ensure electricity for all Indians, Adani Mining is developing and operating mines in India, Indonesia and Australia, as well as importing and trading coal from many other countries. He concluded by indicating that Adani Group's commitment to a world-class infrastructure in the areas of resources, logistics, energy and agriculture stimulated the building of a diversified, competitive and sustainable economy that would bring profound, lasting economic, social and environmental benefits to people everywhere.